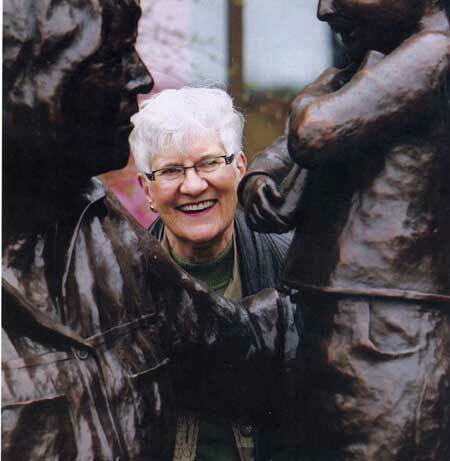 This larger than life bronze statue of Lois Hole, the beloved former lieutenant-governor of Alberta who died in 2005, is located in St. Albert, Alberta. It was commissioned by the city as a tribute to it's most widely known citizen: Lois Hole. The bronze monument was unveiled at city hall on May 14, 2009 before a crowd of about 300, who were enthusiastic despite snow flurries and frigid temperatures. The statue will evenually be moved to Lois Hole Centennial Provincial Park. Lois Hole was a popular figure in Alberta, a politician as well as an entrepreneur, gardener and author. The Lois Hole Library Legacy program, one of Hole's favourite projects, encouraged donations to purchase books. She served as a school trustee as well as University of Alberta chancellor,and was a keen promoter of education. Nicknamed the "Queen of Hugs", Hole is remembered for her caring nature and warm personality. 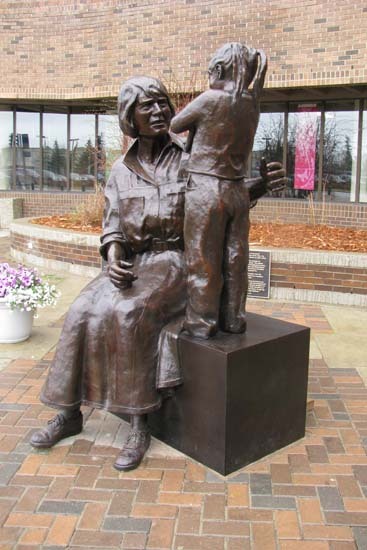 The monument was created by the renowned Alberta sculptor Barbara Paterson, who depicted Lois Hole with a child clutching a book. Paterson created this impressive tribute to Lois Hole over a four-year period, and was particularly pleased at the opportunity to commemorate her as they were friends for 15 years. Paterson wanted to create a tribute that showed her friend's love of children and learning. "She would be thrilled to know that Barbara was doing it," noted Lois' son Bill Hole.